Linn sent this letter to the local newspaper back home in Ohio, The Holmes County Republican. 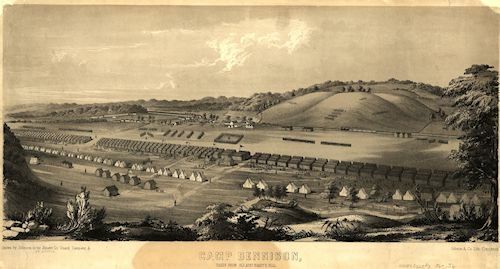 He describes the regiment's exit on November 27, 1861, from Camp Tiffin in Wooster, Ohio, where the regiment was first gathered and trained, their trip by railroad to Camp Dennison, near Cincinnati, Ohio, arriving the next day, and goes on to give details on the camp layout and conditions. CAMP DENNISON, November 30, 1861. --In accordance with a promise made to some of the friends of the soldiers, I undertake what to me is a hard task; viz: addressing them through the columns of a public newspaper. 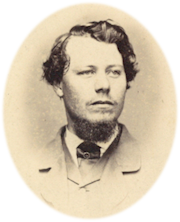 If our friend Mr. Caskey, will find some little corner for my few scribblings, I shall do my best to entertain you with an account of Our first march. As is usual with soldiers we could tell nothing about the time of our departure from Camp Tiffin, until it was close at hand. About 1 o'clock, Wednesday afternoon, we received orders to strike tents, and by three o'clock were ready to leave with one day's rations in our haversacks, thrown over our shoulders, and knapsacks strapped to our backs, making us look and feel as though we were indeed soldiers. We marched or rather waded through the mud to the depot, where we found the cars waiting for us. We immediately went on board, but did not start until 7 p.m. Six men were detailed from each company for guards, to prevent the soldiers from running out and in the cars as we passed along the road. We arrived in Columbus about 3 a.m., and laid there until daybreak. We then had daylight for the remainder of the trip. We saw some beautiful bottom land as we run over this part of the road. It looked quite different from the hills of Little Holmes. At Xenia we took the Little Miami road and followed the winding of the stream down to our present situation, arriving here about 1 p.m., Thursday. We found unfinished barracks, no supper, and any amount of mud. We had scarcely been in camp 20 minutes, until several old women and boys came into camp with baskets filled with pies and apples. It was amusing to see the hungry soldiers crowd around them to get something to eat. Such crowding! such pushing! such shouting of give me a pie, how do you sell your pies? what kind of pies have you ? each trying to speak the loudest, and be the first to get to the baskets. You may bet, that, between buying and stealing, the pies were soon all in the hands of the soldiers. I must tell you what kind of barracks we have. There are ten large buildings to a regiment, one for each company. I will give you a faint description of ours, and then you will have an idea how the rest look, for they are all alike. The building is 120 feet long and 25 feet wide; there are three doors and five windows in it. We have 98 bunks, each six and a half feet long and two and a half feet wide, placed in three tiers along the sides of the building. The lower tier is about 18 inches, the second 4 ½ feet, and the third 8 feet from the floor. They are intended for one man to the bunk, but as it is cold at night, the boys prefer sleeping two in a bunk and uniting their covers. By this means they manage to keep comfortable. We are to have two stoves in this room. Behind this room is another building about 16 by 20 feet, intended for a cooking room. The Capt. And Lieutenants have a small building to the right, and a little back of the front of the company barracks. This is divided in two rooms, but I do not know how it will be finished off, in the inside. We have been engaged in carrying gravel and making walks in front of our quarters ever since we came here. We were taken, yesterday, to the summit of a nice little knoll out side of the guardline, where we had a nice view of Camp Dennison. Some say, that from the top of this knoll we can see across the Ohio river into Kentucky. I know that we can see a great distance. There are nine regiments encamped here; three infantry, three cavalry, two artillery, and one Zouave. The boys are all well and in good spirits, with the exceptions of Alfred Nixon, and George Weatherwax, who have been quite sick, but are now getting better. Capt. Tanneyhill's company are all well, I believe. You must excuse all mistakes. I have written this amid the noise of the whole company, and not being used to writing where there is so much noise around, you will probably find a great many mistakes.